Our first choice at an environment was to build an abandoned diner. One element from the diner environment that Megan really liked was the neon lighting heavily associated with the older themed diners. Here are some photos looking into neo noir lighting and neon diner lighting. Another idea was that when we create the diner sign we could call it Carl’s Diner or something similar as an easter egg to our room. We did a lot of research on diners, looking an abandoned exteriors and interiors to get a general idea of how they look and what props we would need to create. Studying the environment also allowed us to judge how much work we would have to do, how we would divide the work and to help get an idea of how the layout of the environment would look. With creating the diner we had to decide on a time frame for when this would exist as well. We agreed that a 50’s diner is the most interesting to build and overall the most famous out of all the variations with many pulp culture references showing them, the setting of a diner being quite clique in design and the style of it is just amazing to look at. Even now in replica diners like Eddie Rockets or Annette’s Diner in Disneyland the whole checker board floors, neon lights and the leather seats are infamous. After looking at these references we started to list a series of models that would need to be created, starting with the larger props and moving into smaller models to provide more details for the scene. 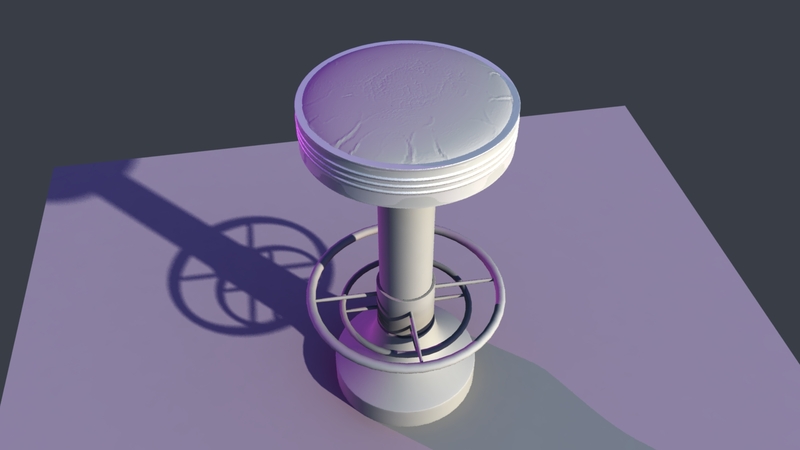 We each decided to attempt some of these models, I had a go at modelling a jukebox and a diner stool. 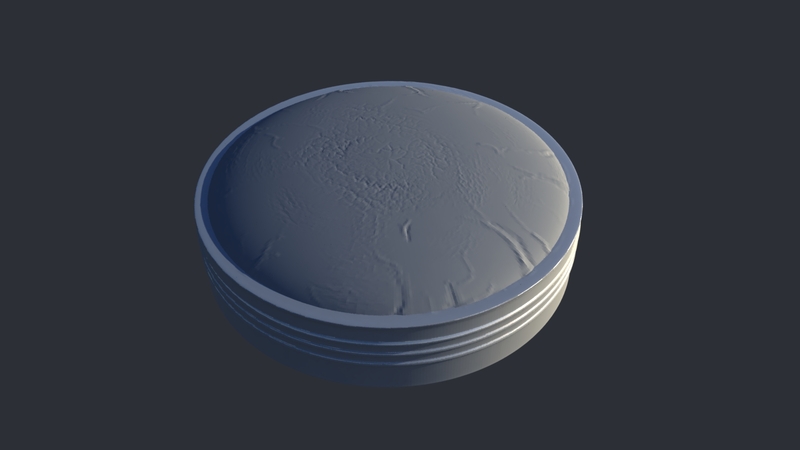 For this stool I made a base geometry in maya, after this i tried my hand a zbrush, i brought the material part of the stool into zbrush and tried to create a leather look. After making a high poly mesh in zbrush i attempted to lower the poly count but keep some detail, this worked pretty well but in the future i might attempt creating maps to add detail to a flat model to try and keep the model more detailed. Here is my first attempt at the stool with detail, after doing this i found that the geometry kind of hovered a bit above the metal section. So i might redo it in the future for my sculpting showreel to improve how it looks. The rest of the model is done in maya, the base of it was smoothed to give a clean curve to it, i also had a go at using some neon coloured lighting to see how it would look on the object. 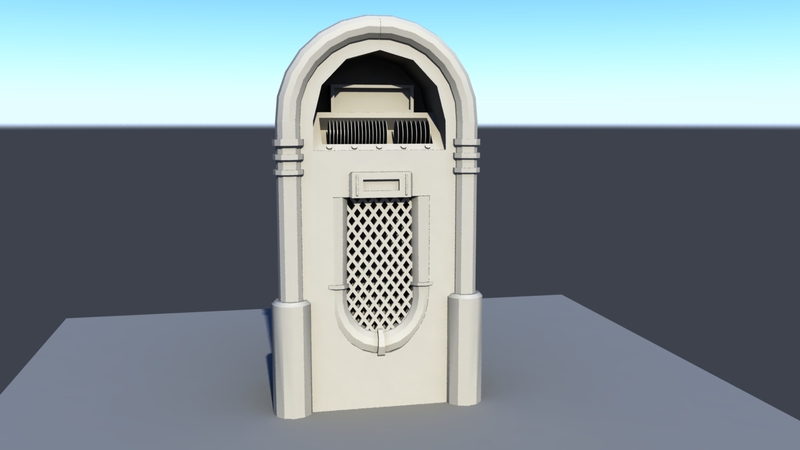 After this i started working on a jukebox to see how it might look. 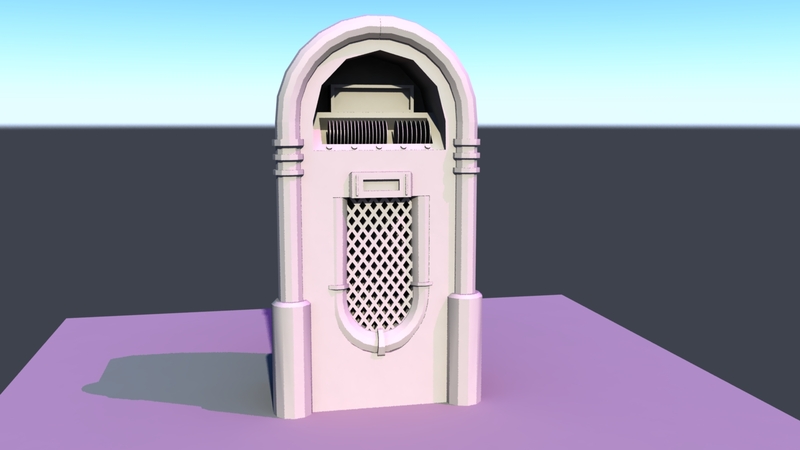 The jukebox i did completely in maya as the object in real life is a lot more blocky and doesn’t need a lot of detailing, it would look better if it was textured but that would be done in the future after the environment project is over since it includes uv mapping the objects. 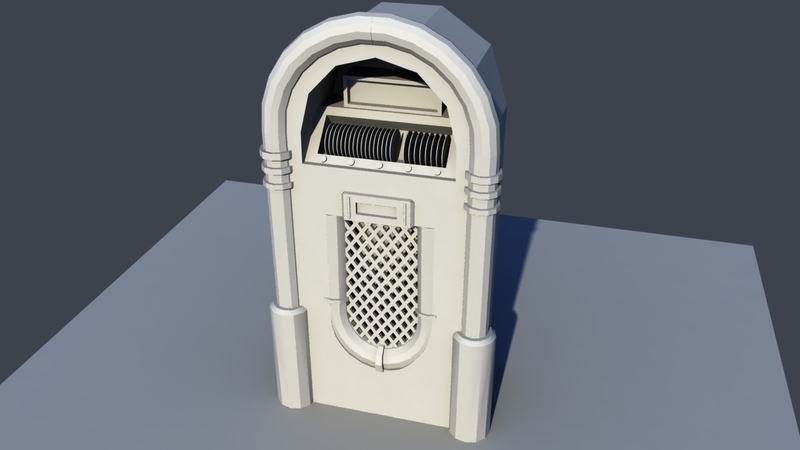 The Jukebox is very low poly but it’s not a bad start on it. One of our first assignments was to create a walk cycle using pre rigged models. Being able to animate a walk cycle has been said to be the bread and butter of an animators skill set. Looking at different references I had multiple attempts at doing walk cycles, looking at cowboys, and normal walk cycles. The following are some references that I looked at. This helped a lot with blocking out the initial poses with the stepped tangent. This stage of creating the animation was a great way to set a solid foundation to build up from. A few things to note are the following. Contact positions: The arms are always opposite to the legs to give balance and thrust. Up Positions: The foot pushes off the ground, lifting the pelvis, body and head to the highest position. After that the leg is thrust forward to catch the body in the next contact pose. 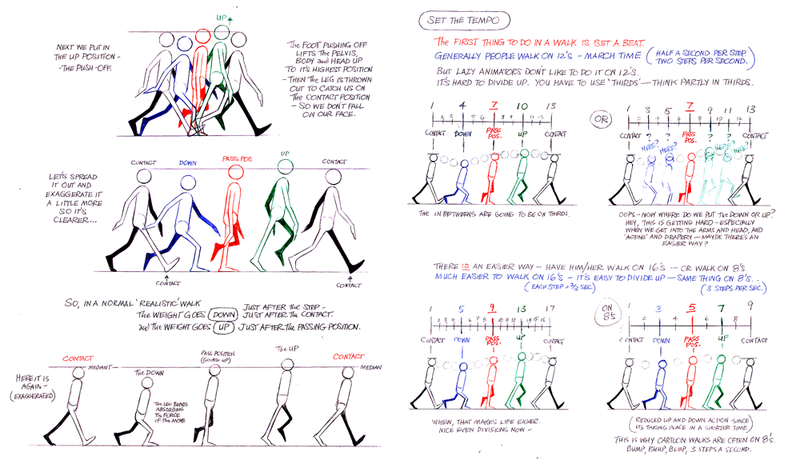 This however is only the core of the walk cycle there is a lot more to the movement of the walk cycle like arms, torso etc and how they move in relation to the legs. Down Positions: This is when the body is at its lowest point of contact is where the leg is bent and is taking the bodies weight. Passing Positions: This is when the body is half way in the walk cycle. After a few passes at doing a basic walk cycle I found it looked slightly robotic. Looking at more walk cycles I found that small changes in the body and micro-anticipation can help make the movement look a lot more natural. Also it helps to fix small things like the feet overlapping in front of each other when walking and the rotation of the shoulders when the arms swing back and forth. Another small detail is the movement of the hips, this can help show if the walking is masculine or feminine.